Soccer Football - Premier League - Manchester City vs Liverpool - Manchester, Britain - September 9, 2017 Manchester City’s Ederson Moraes is fouled by Liverpool's Sadio Mane resulting in a red card for Mane Action Images via Reuters/Lee Smith EDITORIAL USE ONLY. No use with unauthorized audio, video, data, fixture lists, club/league logos or "live" services. Online in-match use limited to 75 images, no video emulation. No use in betting, games or single club/league/player publications. Please contact your account representative for further details. The Barclays Premier League is the one that keeps on giving, week after week. No sooner have we gotten over one problem when another one comes hurtling along the line. Last weekend was no different and thanks to referees Jon Moss and Mike Jones we had plenty to chat about in the bars and clubs around the length and breath of the country. It was not the fact that these officials had been at the centre of controversy over the weekend, but in the way everyone interpreted their decisions. 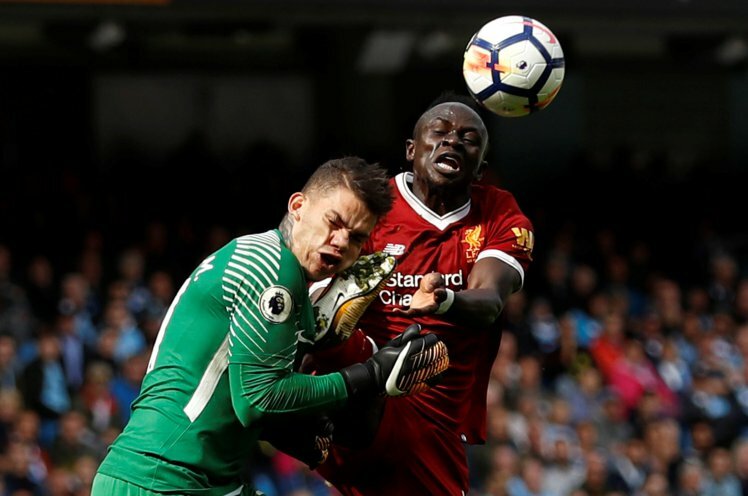 Jon Moss took control of arguably the biggest game of the weekend between Manchester City and Liverpool and the fall out from his decision to send off Liverpool’s Mane for a challenge on the Manchester City goalkeeper is still going on. As a rule I very rarely have much time for the opinions of ex footballers when it comes to refereeing decisions as in my opinion they have not got an idea about applying the laws of the game. So when Jon Moss sent off Mane, cue the usual moaning as to what most of them saw as a bad decision. In fact this is where there is a strange twist to the story, as in my opinion on the day Jon Moss got it drastically wrong as well. As I was watching the game live on TV like most fans I thought to myself that it was a terrible decision to show a red card. In my opinion the player was only going for the ball and if we can not challenge for the ball anymore we may as well just pack the game in, I actually felt at the time that at worst it deserved a yellow card. The difference with this decision was that the challenge had endangered the City goalkeeper,s safety and that is why Jon sent off Mane. The Liverpool player must surely have felt hard done by, but that is the way the modern game has gone and in fairness we have to be thankful as it gives players better protection. A good friend of mine who is a former referee in South Africa, Errol Sweeney, got slaughtered on social media in the aftermath of the game when he posted that he thought it should only have been a yellow card as well. The laws of the game are laid down in front of people who play the game, but the most important thing is how to apply them. Jon Moss got it spectacularly correct on Saturday, not like quite a few of us who got it wrong or maybe it was our interpretation that was wrong. If you fast forward from the incident that happened on Saturday and look at the one that happened in the Swansea and Newcastle game on Sunday you will see a totally different outcome for a similar challenge. The referee in charge of this game was Mike Jones and in my opinion he is an accident waiting to happen every time he enters the field of play. Over the years Mike has given us some great entertainment with the decisions he has got horribly wrong. On Sunday, Mike had a tricky incident to deal with when a high boot by Newcastle,s Matt Ritchie caught a Swansea player around the head area, but it was only punished with a yellow card. The challenge was very similar to the one involving Mane on Saturday but on this ocasssion the colour of the card was different. The fact that the Swansea defender did not hit the ground or indeed need medical attention probably had a huge impact on Mike making his mind up as to what to do. I am not saying on this occasion that Mike was wrong but I also feel he was not correct either. Both of these games brought about different outcomes for similar decisions, something that needs to be sorted out. Interpretation of the laws of the game are vital if the officials are to become more consistent and the only way they can get these big calls correct is to discuss them at meetings and work shops so as everyone is singing from the same songbook, but this will take a great deal of work and understanding. I do not see consistency improving anytime soon.